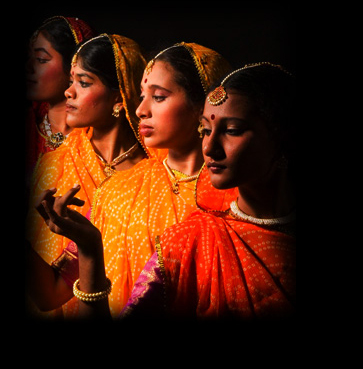 This choreographic work describes the festival of colors – Holi, as being played in ‘Gokul’. The presentation starts with the sutradhaars narrating the appearance of the Gopas and Gopis the next day – face smeared with colors, body in languorous state, sleepy eyes … but the fore-head shines with great fortune; having played Holi with Lord Krishna. The dance presentation highlights the vibrant colors of holi and the cheerful mood of the gops and gopis. The dance delineation of the theme culminates with narration of a verse by the Bhakti poet ‘Padmakar’ that describes the holi played by Krishna and Radha where neither of them apply color, but simply get smeared with color of each other, thus underlining the highest order of surrender and love.